Leroy Anderson, his wife Eleanor, and their young daughter Jane Margareta first came to Woodbury, Connecticut in 1946 to spend the summer in a cottage on Painter Hill Road. (They were not on vacation as some journalists have written.) 1 Captain Leroy Anderson had been released from active duty in the U.S. Army as Chief of the Scandinavian Desk of Military Intelligence. There was a severe housing shortage in the United States in the years immediately following World War 2. The cottage in Woodbury was on land that Eleanor’s mother and her two sisters had recently purchased as a place to live when they retired. (This was not where Eleanor Anderson was born and raised as some journalists have wriiten.) 2 During a July heat wave and drought in 1946, Leroy was digging trenches to try to find some old pipes coming from a spring. He began composing several tunes, including Sleigh Ride (Sleðaferð), in which he envisioned as a musical depiction of the winter season long ago. 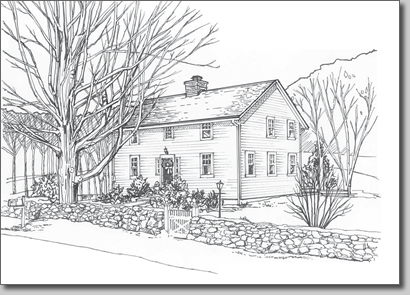 Since the cottage was not winterized, was not insulated and had no heat, the Andersons could not stay at Painter Hill Road for the following winter. Leroy and Eleanor moved to New York City in the Autumn of 1946 where they lived at 19 Parade Place in Brooklyn in an apartment that had been rented by Eleanor’s uncle who had recently died. The Winter of 1946-47 turned out to be one of the snowiest winters on record in NYC. Leroy Anderson completed Sleigh Ride in Brooklyn on February 10, 1948. Sleigh Ride received its premiere on May 4,1948 with Arthur Fiedler conducting the Boston Pops Orchestra at Symphony Hall in Boston. According to BPO Conductor Keith Lockhart, Sleigh Ride is the Pops’ signature work. Meanwhile, Eleanor’s mother and aunts decided to have an old barn on their Painter Hill Road property converted into a house. When the house was completed, Leroy and Eleanor moved to Painter Hill Road in 1949, making Woodbury their permanent home. According to the composer’s widow Eleanor Anderson, "Leroy didn’t set out to write a Christmas piece when he wrote 'Sleigh Ride.' His intentions were to convey the entire winter season through the imagery of a sleigh ride, much in the way that Mozart did with his piece of the same name." Eleanor Anderson remembers hearing Sleigh Ride in New York City department stores right after the first recording was released in 1949. Composer’s intentions aside, this winter composition quickly became associated with the holiday. I began Sleigh Ride in the summer of 1946 in a cottage in Woodbury, Connecticut, where my wife and I were spending the summer with our 18-month-old daughter. The original version began with what later became the middle section. I recall working on it in the middle of a heat wave, so there is no basis for the music except the title itself. That same summer I also worked on Fiddle-Faddle and Serenata. After moving to Brooklyn, New York in the fall I finished Fiddle-Faddle on January 1, 1947 and Serenata on February 12, 1947 in addition to making arrangements for the Boston Pops concerts in the spring. I had felt that the original theme of Sleigh Ride was not strong enough to start the number but would make a good middle section. I finally worked out a satisfactory main theme, introduction and coda and finished the orchestra score on February 10, 1948. Sleigh Ride was first performed on May 4, 1948 in Symphony Hall, Boston as an extra at a Pops concert conducted by Arthur Fiedler. Lyrics by Mitchell Parish were added in 1950. Some 60 years after Leroy Anderson created Sleigh Ride, the composition is still ranked as one of the 10 most popular pieces of Christmas music worldwide. This is in spite of the fact that the word "Christmas" is never mentioned in the lyrics which Mitchell Parish wrote several years after Anderson finished the composition. ASCAP, the American Society of Composers, Authors and Publishers, named Sleigh Ride the most popular piece of Christmas music in the USA in 2009, 2010, 2011, 2012 and again in 2015. Leroy Anderson's original recording of Sleigh Ride was the version most often played in 2010 based on performance data tracked by airplay monitoring service, Mediaguide, from over 2,500 radio stations nationwide. Sleigh Ride was aired 174,758 times in 2010, making it the most-played holiday song on radio for the second year in a row. Sleigh Ride was played 118,918 times during the same time period in 2009. According to Steve Metcalf of Connecticut's newspaper, The Hartford Courant, Sleigh Ride has been recorded by a broader aesthetic range of performers than any other piece in the history of Western music. 4 Sleigh Ride has become one of the most popular musical compositions of the winter holidays throughout the world. Also visit the official website for Leroy Anderson maintained by his family. In recent years it has become popular for people from NYC to rent a house in Litchfield County, Connecticut for one or more months in the summer. That was not the case for the Anderson family. It was difficult for recently released military service members to find housing in the years immediately following the war. No longer employed by the U.S. Army and not yet the successful composer he would become, Leroy Anderson and his family could only afford to live with family. There may have been many other people who found themselves in the same situation. Journalists who write about events that took place 70 or more years ago should be careful not to apply perspectives based on current cultural patterns to their narratives of historical events. Eleanor Jane Firke was born and raised in Champaign, Illinois. Her mother, Beulah Hubbard Firke, was a nurse. Eleanor's father, Charles Wesley Firke, was legal counsel for the Illinois Central Railroad. After graduating with honors from the University of Illinois at Champaign-Urbana, Eleanor Jane Firke moved to New York City for advanced studies. That is where Leroy Anderson was living and working as a musician and arranger. That is how Eleanor Jane and Leroy met in NYC. After Charles Firke's unexpected death during surgery in Decatur, Illinois, Beulah Firke moved east to Connecticut to be closer to her daughter Eleanor Jane, her only child. She found work as a nurse for the State of Connecticut at the Southbury Training School in Southbury, Connecticut. Mrs. Firke's two unmarried sisters encouraged their sister Beulah to find a place where they could all live together in retirement. Mrs. Firke found the property at Painter Hill Road. That is how Leroy and Eleanor Anderson and daughter Jane came to live in the cottage on Painter Hill Road. By the time the other two sisters, Eleanor Hubbard and Marie Hubbard, retired and came to live at Painter Hill Road, Leroy and Eleanor built a house 5 miles away on Grassy Hill Road.